All ages welcome. Under 12's must be accompanied by a parent or guardian. ID check required. THE FIELDS AT SIAM COUNTRY CLUB. Thailand’s four-day celebration of the arts and sustainable living returns in 2018 for its fifth installment. This year is set to welcome international live music acts and DJs, perspective-shifting talks and workshops, world-class cuisine, cutting-edge architecture, and much more. Get a taste of the celebration with our official launch movie. Explore our highlights from Phase 1 all the way to Phase 3 on our program video. You can still get tickets at the door and are available between 13 - 16 December 2018. All attendees wishing to stay on site in the General Camping, Boutique Camping or in your own RV, please be sure to purchase separate accommodation and parking permits. 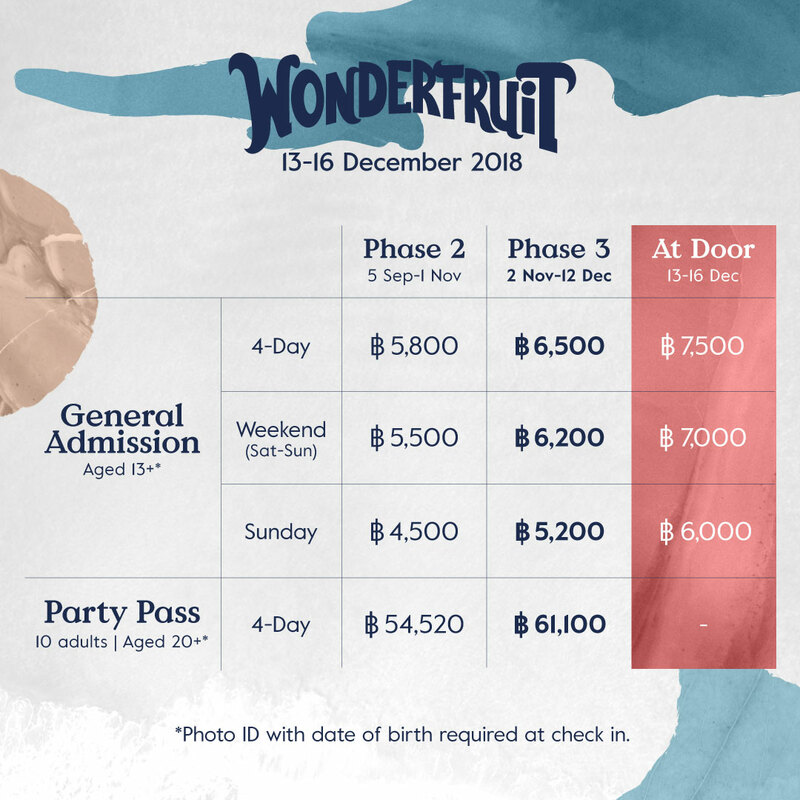 Tickets for Wonder Feasts as well as for Wonder Kitchen are an add on and must be purchased separately from tickets to Wonderfruit. Wonder Feasts are a 200-person communal dining experience at the Theatre of Feasts presented by award-winning chefs while Wonder Kitchen brings an intimate and interactive 20-seat Chef’s Table concept to The Fields. For more information on tickets, accommodation and program across all 6 Pillars: Art & Architecture, Music, Farm-to-Feats, Talks & Workshops, Wellness, and Family.